The Auckland Sun newspaper was established as a tabloid format morning paper in competition with the New Zealand Herald. It was launched on 10 August 1987, but closed less than a year later, the final issue being published on 8 July 1988. The Sun’s photograph collection was subsequently purchased by the newspaper’s two librarians who used it as the basis of an image bank and news service. The collection was then gifted to a former Sun reporter, who in turn donated it to Auckland Libraries in January 2015. It consists of 23 boxes of black & white and colour prints, and 4 large boxes of original negatives. Because of the short life of the newspaper, the collection is essentially restricted to a very limited time period - 1987/8 – but nevertheless covers such important events as the 1987 election and the Labour government, the Stock market crash, and the demolition of His Majesty’s Theatre. 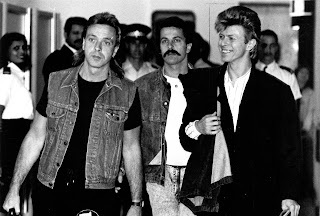 It also includes this photograph of the late David Bowie arriving at Auckland International Airport on 26 November 1987. Ref: Sheryl Campbell, David Bowie arriving at Auckland International Airport, 26 November 1987, Sir George Grey Special Collections, Auckland Libraries, Accession 1329. Read a tribute to David Bowie over on our pop culture blog. Great shot! And I'm so pleased the library has these photos now!